Women’s roles in the Palestinian-Israeli conflict are frequently analysed in terms of traditional views on femininity, either as active peacemakers or as passive victims. ACTI-VISTAS explores perspectives that go beyond these paradigms during three days of public lectures, discussions, and screenings. How do women activists mobilize their gender and ethnic positions? In what ways do new technologies and platforms inform and shape their political struggles? Putting the finger on the pulse of contemporary women’s activism, we explore feminist strategies that activists currently employ. This event will present fresh narratives of political agency, untraditional representations of identity and alternative forms of resistance. Wednesday, 20 November, 20:00 CREA . Public lecture with Amira Hass, award-winning journalist. Amira Hass is an Israeli journalist and publicist who has been writing about the daily life in the Palestinian Territories for decades. She lives in the Territories and also has lived in Gaza for some time. Hass’ critical work forms a very important and welcome addition to the often non-critical way the Israeli media reports on the Occupied Territories. She has won many awards during her career, such as the Prize for Press Freedom of Reporters without Borders and the Lifetime Achievement Award of the International Women’s Media Foundation. In her lecture Hass will speak about Israeli activism against the occupation. Thursday 21 November, 9:30 – 17:00 VOC-zaal, Bushuis, University of Amsterdam. Rima Jawabra (activist, social worker and actress). Performance by Orly Almi (choreographer, improviser, feminist, activist). lecture on video-art by Nat Muller (curator, art critic). 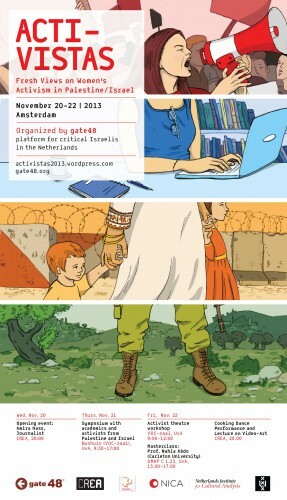 Organized by gate48–platform for critical Israelis in the Netherlands In cooperation with the University of Amsterdam CREA and FFIPP-Educational Network for Human Rights in Palestine/Israel.